ruthdelacruz | Travel and Lifestyle Blog : A Gift from Accessorize! A message from Bloggers United (that group of bloggers who come together for a cause - and now they are more powerful than Voltes V and Bioman combined!). And I read and re-read it right, Accessorize has something for us! So come the following Friday, I dropped by 7 For All Mankind store in GB5 (as instructed) to get the gift. It was timely that I was in the area for an event. So what's in the bag?! I opened it as soon as I got to the office (yes, I usually attend events and go straight to work). Waiting for the whole shift - 9 hours plus 1 hour travel time back home is too long for me. I had to know what's inside..
Opps.. The tag first.. It says Joy to the World! Accessorize is giving me so much joy in my little world! The "gift" was wrapped in the nice pink paper.. How cute! How special! And.. Tadaaah!!! Isn't it nice? It is a clutch bag with that big bow! Shining, shimmering, splendid! I looove! And, it is not just a clutch, it can be a sling bag too! How nice that Accessorize team know exactly what I wanted! Thank you. Thank you! I will sure bring this on my assignment to Indonesia! 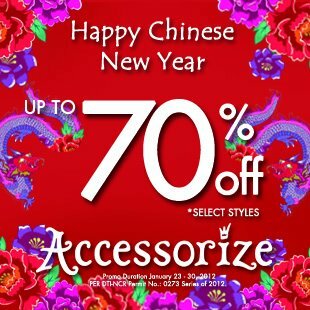 Now, I somewhat feel pressured to post Outfit of the Day, but let's just see..
And here's a treat to all Accessorize lovers, the store is slashing 70% off on selected items! This is only from January 23 to 30, 2012! I will see you girls on the cashier area! © ruthdelacruz | Travel and Lifestyle Blog : A Gift from Accessorize!